Over 40 Amateur Of The Week: Wise Beyond His Size! Christopher is on the cutting edge of the weightlifting scene in South Korea. See what motivated this 41-year-old into the weight room and onto the competition stage! I used to be skinny and hid my arms and torso under double-layered long-sleeve shirts—even during hot summer months. I suffered like this throughout my teenage and college years. In 2002, I was offered a job in South Korea teaching English. At first, I refused the job, but then reluctantly took it. It was one of the greatest choices I ever made. In 2004, while working this job, I went to work and looked at the stairs I had to climb to my office. I remember the unending feeling of dread coming from within my chest as I climbed them to my office. When I finally reached the second floor, I opened my office window and was greeted by the sound of a noisy, energetic rugby team playing on the school's green Astroturf field below. I looked curiously down at the boys. They were half my age and fitter, stronger, and bigger than me. That evening, I shared my grief with my wife, who told me about a local gym. I found the gym near my home and was befriended by a young Korean man named Sang Ki who was a certified personal trainer. He desperately wanted to learn how to speak better English, so I traded an hour of teaching English in exchange for an hour of personal training. Learning about clean eating was the overhaul. I changed my diet to whole foods, clean eating with a tight health-filled scheduled, and a new "bodybuilding lifestyle" emerged. When I went to work, I sailed up the same stairs. Others at work started to say, "You look—different." That was a clue that I was on the right track. My biceps started to grow and a feeling of surrealism started. I looked forward to pounding weights after work and never missed a day. Four years into my bodybuilding bliss, I went to a local bodybuilding show. That day, I took my camera and was mesmerized at the show. I said, "I will do this someday." It wasn't a maybe or a might. It was a full-blown "will." My weight increased each year. I packed on muscle mass, and my legs, calves, shoulders, and, back grew. The one body part I love to flex and show off is my arms. I don't wear anything less than a tank top on a summer day. My confidence level is high and I don't hide my arms anymore. Food is more important than exercise, in my opinion. Without proper nutrition, you can't grow or diet. The rubber met the road the day I learned to eat correctly. My passion wasn't instant. It was a slow process that continues today. My passion for bodybuilding came out of need. I needed to change my life. In return for the change that happened, the bodybuilding lifestyle I find myself in is golden. What Aspects About the Sport Fascinate You? Bodybuilding is a sport. It's not a hobby. I love when I look in the mirror and see changes in my body. I keep asking, "Is that really me?" It's fascinating how others view me. Last year, my wife, daughter, and I were walking on the beach when a group of teens ran up and wanted a picture with me flexing. In our city's luxury shopping mall, a woman on the escalator almost got hurt rubbernecking to get a better glimpse of me. While I was going down, she was going up. Her husband pulled her head back before it got caught as the wall of the escalator narrowed. When I started to lift, I was introduced to a young man who later became Mr. Korea in 2012. His name is Mr. Kim Chong Won. I met him after working out for four years. He inspired me to go really deep into bodybuilding. We became good friends and in a year I was surrounded by a "muscle family" and was introduced to major players in the bodybuilding world. Mr. Song Jae Pil, a world champion and international competitor, showed me in more detail how to lift effectively. And lastly, owner of Galaxy Health and Fitness, Mr. Moon Yong Seon, has been the greatest motivator to move me into the next level. I can never repay him for the support and kindness. My office wall is covered in pictures I cut out of magazines of who I want to be. My gym is a meeting place for young bodybuilders who are on the cutting edge of shows, so there is much talking and sharing. As I walk on the street and look at people, I think back to what I looked like and how far I came. That propels me forward. At 41, I have nothing to lose, so I'm going to take this dream as far as it will go. Why stop now? I believe that in coming years there will be a great surge in the market for 40-plus fitness models. I want to be a 40-plus fitness model in magazines. As men and women get older, the number of bodybuilders lessens. However, what I see from the lessening is a new incredible source waiting to be tapped. I want to be a fitness model and open a gym. Maslon Health & Fitness has a nice ring to it! As for now, I plan to do as many shows as I can for as long as possible. I often see model and bodybuilding events in Miami and Las Vegas. That's a goal waiting to happen. 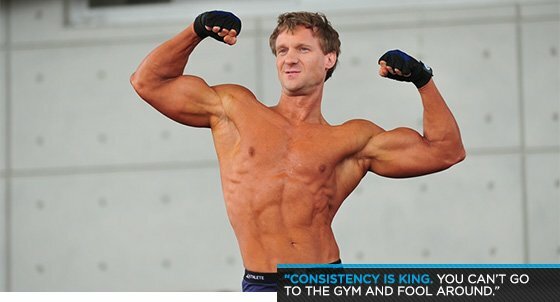 Consistency is king. You can't go to the gym and fool around. If you go to the gym and dabble around you will get nowhere. Consistency is power, consistency in eating and supplements, consistency in a scheduled bodybuilding lifestyle Monday-Saturday. Know what muscle group to work out before you go to the gym and only do that group. Lee Priest. He's the patron saint of all bodybuilders in the 5-foot-7 and under range. When I was younger, I was told you needed to be (Arnold) tall to be a bodybuilder. Then, I heard about Lee Priest. Lee defies the law and is massive. He showed me anything is possible. I look forward to the day I meet him and tell him "Thank you for leading the way." Bodybuilding.com is the best for supplements. I order online with ease. Also, I look at how many new connections and friends I make by reading and responding to posts online at Bodybuilding.com.